Baptist Principles is intended to serve three segments of our Baptist life. It is first of all for individuals, pastors, and laity who want to do serious thinking about Baptist principles, work through the tensions, and apply his or her evolving conclusions to his or her own personal life and ministry. Second, this book is for students, those theologically trained and those not trained except for their life within the local Baptist church, and especially for those who sense a further and deeper commitment to that involvement. Third, Baptist Principles is for pastors and church leadership who want to dialogue together towards common ministry goals and who seek a deeper understanding of what differentiates us as Baptists. 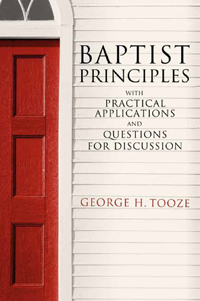 In this remarkably written book, George Tooze declares and defines the tensions that are inherent in any Baptist congregation because the potential for differences of faith and interpretation are enormous. Each of the book’s chapters concludes with a series of provocative questions that challenge and define Baptist principles and living a Baptist life.